In our report on mobile mania (in the last issue) we looked at the supply chain side of mobile, probably the best understood - but still an evolving market. Here we will look at the consumer/retail side of the mobile mania. The last few months have brought a revolution in the consumer mobile shopping experience. We have moved from the smart phone as a ‘small PC’ device with web apps ‘right sized for the mobile platform’ to its own unique channel with multiple frequency options: cellular, Wi-Fi, GPS, sensors, RFID, bar-coding, and high frequency audio. These interact across the cellular network leveraging and increasing cell usage (and harvesting dollars for AT&T, Verizon, T-Mobile, and Sprint). Our research has shown a significant increase in the number of enterprises that will evaluate and buy technologies with which to engage the consumer this year. Budgets, which in many cases were zero last year, are now in the six and seven figure range to figure out, purchase, and implement these technologies. Though most companies would qualify themselves as pilots, there are many that have already embraced, decided, and implemented. And most of those companies, it is important to note, have taken a multi-channel, multi-technology and multi-frequency strategy to go live. Recently, I hosted a panel at the Nation Retail Federation with panelists from companies such as Best Buy and Simon (mall operators with plenty of retailers as their customers). They are early, but successful, adopters of these technologies, and it is clear that they are leaving themselves open to the consumers’ ‘vote.’ In other words, the technologies that the market settles on may be years in the making and will ultimately be decided by the consumer rather than by the retailer. The shopper’s entry point into shopping can come from many channels. The internet channel can be PC- or mobile-based, using the various web applications from a merchant, coupon promoter, or a social network like Facebook, with viral coupon downloads. Alternately, there is the mobile channel (cellular-based world) with Smartphone-app-loaded locating applications that interact in real-time to determine retailers in your proximity. Proximity is taking on a whole new meaning. As the technologies get more practical—cheaper and easier to implement—the ability to fine grain location, leading the shopper to the very location—the very shelf—becomes possible. Behind the scene are analytic engines (the technology sector with the highest planned investment by merchants, according to our 2012 Business Priorities research) that capture and analyze data about programs, traffic and customers to determine these various programs’ successes. They can analyze important store operational data as well. Let’s look at customer-engagement technology channels for a view of today’s shopper options, and walk through the differences. 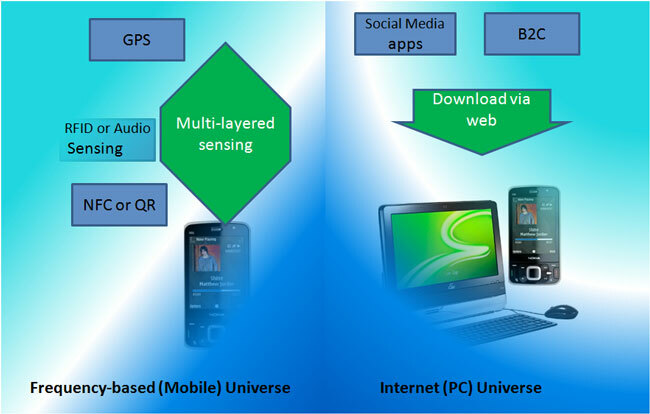 Figure 1 shows the mobile versus the PC/internet channel. The home computer is still predominately the research channel. The store is the higher purchasing channel, though internet purchasing is surely increasing significantly. Here, statistics of channel purchasing are really important. Web research has a fairly low conversion rate, but in-store sales conversion is much higher. So the concept here is: get customers in the store (which not only provides the higher conversion but also gives the ROI needed for the higher investment in brick and mortar) and they will shop. This is why the ‘web only coupon’ strategy falls short. It is only half of the equation; mobile is the other half. The younger demographic, who tends to prefer the mobile channel, will use the cellular network and mobile apps more. Potential shoppers may download coupons to print or load on their smart phones and convert themselves to customers, i.e., get to the store to buy. So both options need to be part of the equation. Now comes the question—what is actually happening out there. Here is where the GPS and other frequency-based solutions come into play to locate the customer or have the customer locate you. There is a raging debate in the technology provider community regarding which technologies will best serve the market—provide location/proximity, as well as intelligence—at the right price. The reality is that on the shopper/consumer side of the equation there are always shoppers who will prefer a certain approach. And the retailer is better off, rather than engaging in the technical merits of methodologies, really following the customers on this one, because the technology that will dominate is an unknown at this point. Retailers can surely influence the outcome by forming federations that embrace member-based loyalty programs and provide broad access to the consumer (such as the travel industry does). For retailers, this is a huge departure from their current modus operandi and is unlikely to occur on a broad enough scale to tip the market, though it gets discussed around town. 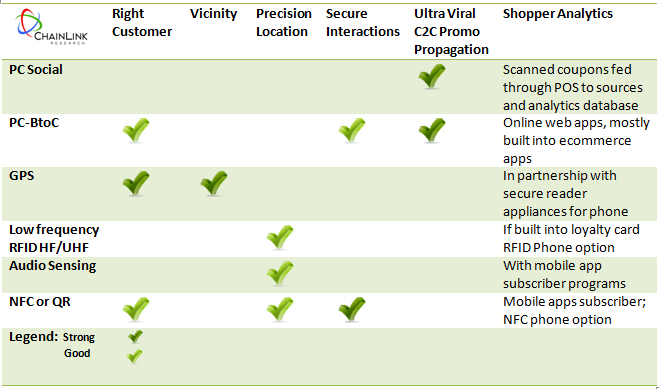 If you look at the above-mentioned technology options (see Figure 2) in terms of the technical capabilities required to attract shoppers, bring them into the store, complete a transaction, and gain analytics, you rapidly realize that a multi-layered strategy is required (unless the retailer invests in building their own end-to-end strategy, which so far we have seen no one attempt). shopkick, a new player in this game makes a strong argument for ‘precision locating’ crowd contrasting GPS. The GPS can locate the consumer somewhere nearby and audio or RFID can offer the precision to bring the consumer to the store and right to the shelf. Square, about whom we have written before, will provide, at no charge, an appliance for existing smart phone users to plug into their phone that can scan their own credit card for on-site payment. So you don’t have to rush out and buy a new phone today. foursquare, pioneer in the Location Based Services space, fuses LBS with social elements. Free app to user, merchants post promotions based on the user’s location. Other RFID modes are still king in the store. Some of the traditional loss-prevention players, who have most of the retail stores as customers, will surely not lose the store front without a fight. A recent announcement by Tyco Retail Solutions about their partnership with Reflexis for store analytics is a case in point. Other mobile in-store options providers such as Motorola may be taking a wait and see approach. But their investment arm is not sitting idly by, with investments in such firms as Airclic, Scanbuy, and Nearbuy Systems. More traditionalists, like TIBCO (Spotfire), SAS, DemandTec/IBM, SAP, and Oracle—you name it, plus the huge market of multi-channel loyalty companies such as Loyalty Lab1 are all competing for the big analytics dollars. Don’t count them out without a fight! 1 While we were writing this article TIBCO announced the purchase of Loyalty Lab. As we said, don’t count these players out!